Abigail worked with Co-Designer Bob Bonniol, of MODE architectural, to design volumetric light sculptures for the flagships store escalator cores of luxury retailer, Nordstrom. Working for the architectural firm Callison, and for Nordstrom; they designed and implemented four elegant LED Light Weave installations which have been installed in the Vancouver, Chicago, and Toronto stores. The Light Weaves are comprised of breathtakingly light weight custom copper strands which drop 20’ to 60' from the ceiling. Individually controlled custom LED nodes are arrayed in a regular grid allowing for a dimensional and volumetric display of programmed patterns. Abbey and Bob created a suite of evolving and varied ambient programming, which modulates with time of day to reflect the energy levels of the store environment. Additional programs were created for holidays and special events. The custom Light Weave LED sculptures were manufactured by Tait Towers, and installed by systems integrator 4Wall. Abbey was invited by Chris Kuroda to collaborate on a co-design for the current Phish tour - An amazing opportunity to work together on design for this legendary band and their incredible live performances. 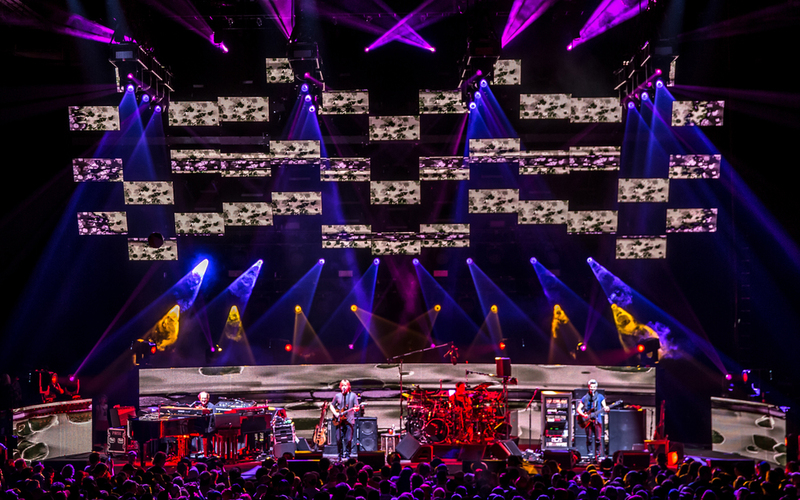 The goal creatively for introducing and incorporating a video element into the Phish touring show was that the lighting and video function as parts of one visual system. The production design for the show consists of a clean, simple architectural environment created by the video screen surfaces. A low semi circular video wall encloses the band and defines their performance space. During the first set a slim, stage wide, rectangle of video screen hangs above the stage; echoing the minimal, linear array of the floor LED. The lighting for set one is trimmed low, close to the screens, creating an intimate environment. At the start of the second set the flown screens pull apart and and deconstruct into an array of irregularly spaced individual tiles. The lighting positions travel out at the same time, opening up the shape of both systems; enlarging the scale of the performance environment and creating a flow of areas of negative space. In the first parts of the show the video content is more spare, and minimal, often filling the entire area of the screens in overlapping, shifting planes of color - to establish the architecture of the set, cleanly present the band in the performance environment, and introduce the visual element of the screens into the show. In the later parts of the show both the physical environment and the content evolve to be looser, more broken up, less flat, and more active. The images travel more across the screens; sometimes distorting and redefine the shape and space. The content design takes advantage of the Roe Hybrid tiles, which provide both a medium and a high resolution surface in one plane. Lighting and video are operated completely improvisational by Chris from one console. The video content was created by Abigail and Dan Scully. The incredible expanding screen was provided and design engineered by Tait Towers. What better way to celebrate Independence Day than with the awesome music of The Roots. The Philly 4th of July Jam, broadcast on VH1 and directed by Alex Coletti;, also featured Nicki Minaj, Ed Sheeran, Jennifer Hudson and Aloe Blacc. And fireworks, of course. This was Abbey's fifth year lighting the show for producers GeeMirkin Production and ESM. The Kennedy Center presented a free concert featuring John Legend with inspiring acts who made their fame through YouTube: Lindsey Stirling, Les Twins, Playing for Change, Scott Bradlee & Postmodern Jukebox, and Mike Relm. The show was produced by Salli Frattini and Sunset Lane Entertainment, and directed by John Gonzalez. Abbey was happy to be asked to work with this great team again, and to have another opportunity to meld her lighting with the awesome video from Obscura Digital. The three videos feature the artists Tori Kelly, MR MR and Aluna George, wearing the fashions of former CFDA Awards winners Rag and Bone, Band of Outsiders, and Alexander Wang. We just helped to launch the Electric Holiday windows for Barney's New York. We were thrilled to be asked to design the windows by our long time client Disney. It was an exciting night celebrating the windows and the kickoff of the partnership between the two companies. It was a rare opportunity to be asked by both Disney and Barneys to create the environment within the windows. True to the Barneys style they wanted truly outside the box and surprising in terms of a holiday display. The approach was to create a video sculptural environment as a canvas. Disney created a special moving short that blended the two worlds of both brand and then we in turn created additional animation and lighting that surrounded and supported the Disney centerpiece. We worked incredible closely with the folks at d3 all throughout the design process. They supported us and Disney in the most fantastic fashion. They put together video below that documents wonderfully the design and creation process.